SPX futures were positive overnight until 6:45 am, when the Commercials weighed in. I am illustrating a probable way the Commercials went from -132,091 short contracts on January 22 to -511,373 short contracts last Monday. It has been happening gradually over the past two months since the markets have been thin and getting thinner at each rally. You may be wondering how over $8 billion went into the stock market last week, yet the entire week was a loss. It appears to be happening again this week. The reason is that, while the market isn’t performing as it had, there is still a fear of missing out (FOMO) of the next rally. Wall Street and the media are still sending out glowing reports about the next rally. The Commercials are capitalizing on this by selling short in the first two hours of the day to retail investors. You can see the action, like clockwork, where the market is sold until 11:00 am every day. The Commercial activity is usually the first and last hours of the day. 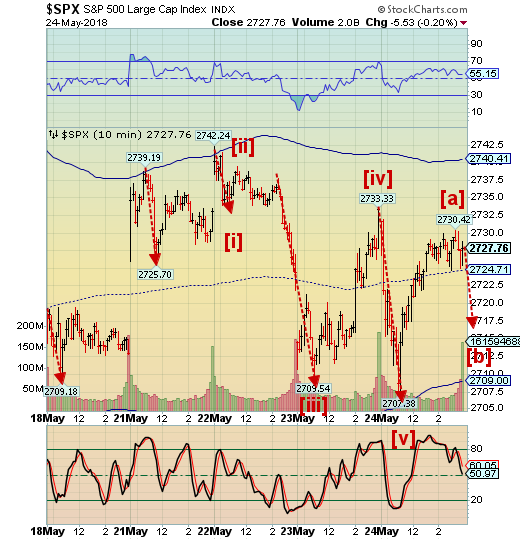 On May 22, the selling occurred at both intervals. Today we may see a sharp decline (Wave [b]) until 11:00 am., then a rally (Wave [c]) into the close due to the Memorial Day weekend. It appears that next Tuesday the decline starts in earnest. NDX futures are flat this morning, compared to SPX. The action in the NDX isn’t as regular, since it appears that the FAANGs are not being bought as vigorously since the earnings announcements. Europe is where the action appears to be, although the equities markets there appear to be rallying. Yesterday the STOXX completed an impulsive decline. 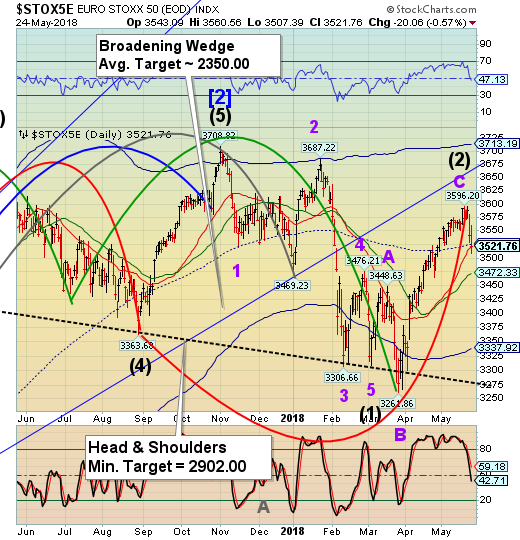 Today it appears to be in need of a Wave 2 retracement. This can be a bit discombobulating, since the market appears to be rallying on bad news. 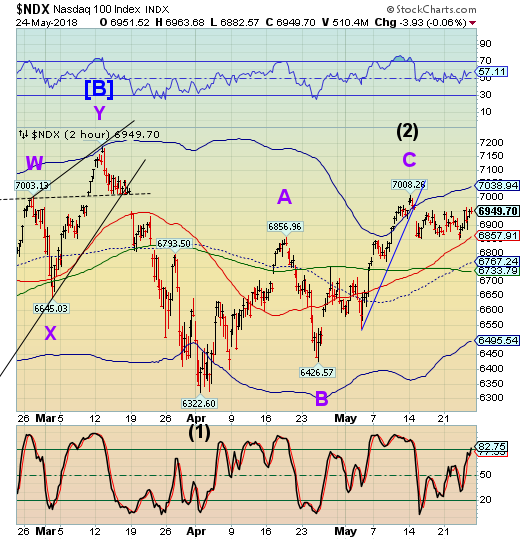 However, seem my comments on the SPX. The same pattern applies. VIX futures are green this morning, although they were red just a couple of hours ago. WTI futures are being slammed this morning. 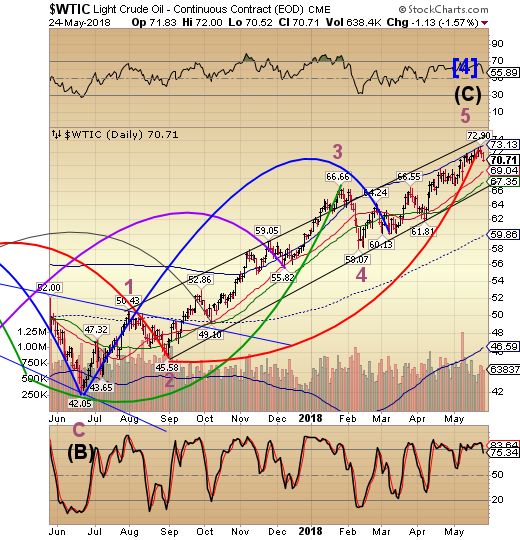 As discussed, the Master Cycle in WTIC came a week later than the Model indicated. It appears to have been worth the wait. While crude oil did not “limit down” as lumber has, it appears to have started its decline with a bang. ZeroHedge reports, “As we detailed earlier, what OPEC can jawbone up, OPEC can - apparently - jawbone back down. 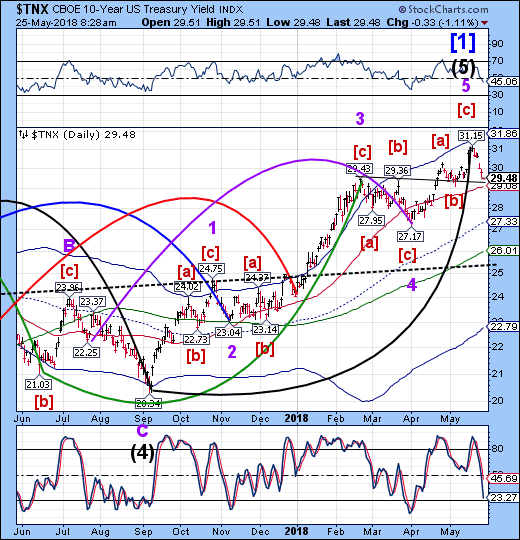 TNX appears to have completed its first impulsive decline from the top. 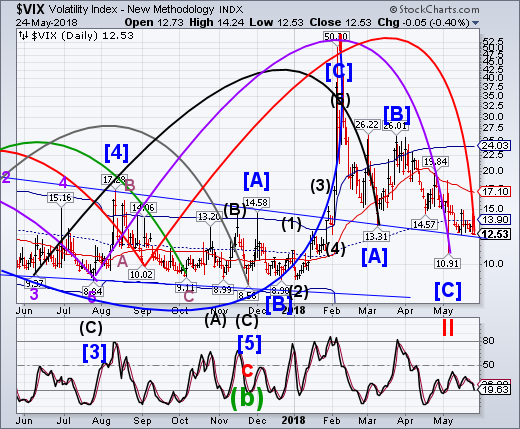 It is in need of a bounce that can be shorted (or long UST).